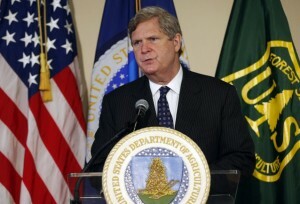 U.S. Agri­cul­ture Sec­re­tary Tom Vil­sack. The Unit­ed States Depart­ment of Agri­cul­ture plans to announce a set of vol­un­tary ini­tia­tives aimed at help­ing farm­ers, ranch­ers, and for­est land own­ers respond to cli­mate change by increas­ing car­bon stor­age, reduc­ing car­bon emis­sions, and sup­port­ing resilience in the face of extreme weath­er. Sec­re­tary of Agri­cul­ture Tom Vil­sack is expect­ed to make the announce­ment Thurs­day dur­ing a vis­it to Michi­gan State Uni­ver­si­ty, where Pres­i­dent Oba­ma signed the 2014 Farm Bill. The ini­tia­tive is based off of ten “build­ing blocks” that cut across the agri­cul­tur­al sec­tor and seek vol­un­tary action from farm­ers, ranch­ers, and for­est land own­ers to reduce their car­bon emis­sions. Through these vol­un­tary pro­grams, the USDA hopes to reduce net emis­sions relat­ed to agri­cul­ture by 120 mil­lion met­ric tons per year by 2025 — the equiv­a­lent of tak­ing more than 25 mil­lion pas­sen­ger vehi­cles off the road. In 2013, the agri­cul­tur­al sec­tor account­ed for 7.7 per­cent of the Unit­ed States’ green­house gas emis­sions, with methane and nitrous oxide being the pri­ma­ry green­house gas­es released. Methane is large­ly released through live­stock pro­duc­tion, via fer­men­ta­tion in the stom­ach of rumi­nants like cat­tle, sheep, or goats, or through manure man­age­ment. Nitrous oxide is released when excess fer­til­iz­er isn’t absorb (sic) by soil. To achieve these reduc­tions, the USDA plans to encour­age farm­ers, ranch­ers, and foresters to adopt a slew of sus­tain­able prac­tices, from improved nutri­ent man­age­ment to enhanced for­est con­ser­va­tion. To reduce fer­til­iz­er pol­lu­tion, the USDA hopes to increase the U.S.’s amount of no-till crop­land from the cur­rent 67 mil­lion acres to over 100 mil­lion acres by 2025. To tack­le methane from live­stock pro­duc­tion, the USDA intends to sup­port the instal­la­tion of 500 new digester plants — meant to turn ani­mal waste into renew­able ener­gy — over the next 10 years. The depart­ment will also max­i­mize efforts to improve ener­gy effi­cien­cy and increase the use of renew­able ener­gy, espe­cial­ly the use of bio­mass as a fuel source. The ini­tia­tives also focus on increas­ing and man­ag­ing exist­ing forests on both pri­vate and fed­er­al lands. Under the For­est Stew­ard­ship Pro­gram, the depart­ment hopes to pro­tect an addi­tion­al of 2.1 mil­lion acres of non­in­dus­tri­al for­est on aver­age each year. The USDA also wants to increase the num­ber of urban forests in the coun­try — to reduce storm water runoff and urban heat island effects while increas­ing car­bon seques­tra­tion and urban prop­er­ty val­ues — by plant­i­ng an addi­tion­al aver­age of 9,000 trees each year. The ini­tia­tives are vol­un­tary, though the USDA plans to incen­tivize par­tic­i­pa­tion by offer­ing grants, low-inter­est loans, and tech­ni­cal assis­tance, accord­ing to the Asso­ci­at­ed Press. In con­junc­tion with the USDA’s ini­tia­tives, sev­er­al envi­ron­men­tal and agri­cul­tur­al groups have announced new com­mit­ments to reduc­ing emis­sions through new con­ser­va­tion and mit­i­ga­tion efforts. Among the orga­ni­za­tions pledg­ing new ini­tia­tives are Field to Mar­ket, a sus­tain­abil­i­ty-focused agri­cul­tur­al group that hopes to curb emis­sions through­out com­mod­i­ty crop sup­ply chains; the Fer­til­iz­er Insti­tute, which has pledged more than $6 mil­lion to nutri­ent research; and the Amer­i­can For­est Foun­da­tion, which announced it would work with the U.S. For­est Ser­vice to work with landown­ers in the West on wild­fire mit­i­ga­tion strate­gies. Last year, as part of Pres­i­dent Obama’s Cli­mate Action Plan, the USDA cre­at­ed sev­en region­al “cli­mate hubs” to help farm­ers bet­ter under­stand how cli­mate change will affect them. In the past, how­ev­er, the USDA has been cau­tious in link­ing extreme weath­er to cli­mate change, with the depart­ment refer­ring to cli­mate change as “weath­er vari­a­tion” when it pro­motes pro­grams to farm­ers. Defend­ing this move at the Amer­i­can Farm Bureau Federation’s annu­al con­fer­ence in Jan­u­ary, Vil­sack said that talk­ing about cli­mate change can move the con­ver­sa­tion into polit­i­cal­ly charged ter­ri­to­ry, some­thing that can turn off farm­ers and damp­en progress. Fol­low­ing the release of the 2014 Nation­al Cli­mate Assess­ment, how­ev­er, Vil­sack warned that cli­mate change would have a pro­found impact on the country’s agri­cul­tur­al sec­tor.